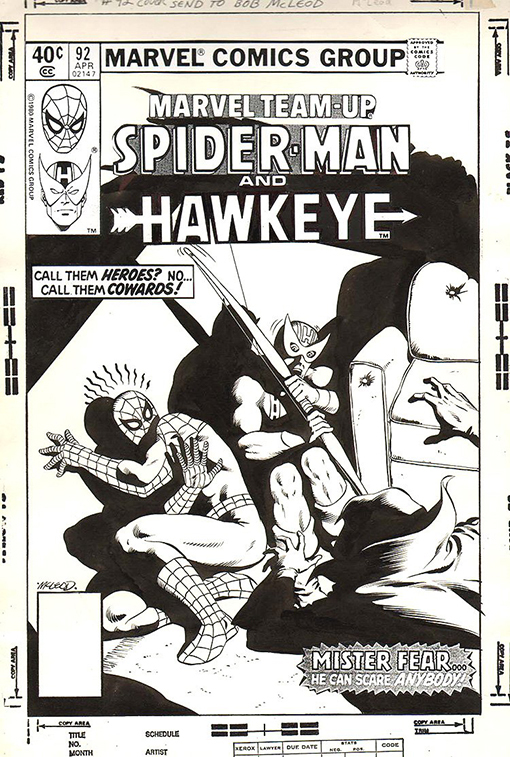 The published cover for Marvel Team-Up #92 features pencils by Al Milgrom and inks by Josef Rubinstein, so I was intrigued when I came across this version of the cover inked by Bob McLeod. There's a clear note at the top of the page that says "Send to Bob McLeod" so I wonder how it ended up being inked by Rubinstein instead. Click on the image below to see a larger version of the cover with Bob McLeod's inks. I also penciled it. They didn't like it, so they had Milgrom and Joe re-do it. Too bad! I think I prefer your inks to Joe Rubinstein's, so I bet your original cover was great. Thanks for the reply.